From The Motor, October 6 1943. Please note: The technical advice and information given in this article is that of the original author and the publication cited. The Cornwall Austin Seven Club, its officers and members do not necessarily endorse the advice given in this article, and do not accept any liability for loss, damage or injury from persons acting upon that advice. Anyone following the advice given in any of these articles, shall be deemed to have accepted this statement. Our technical members are only able to answer questions relating to the Austin Seven (1922-1939) and may not be able to answer any questions arising from this article as they may have developed their own method of undertaking the work. 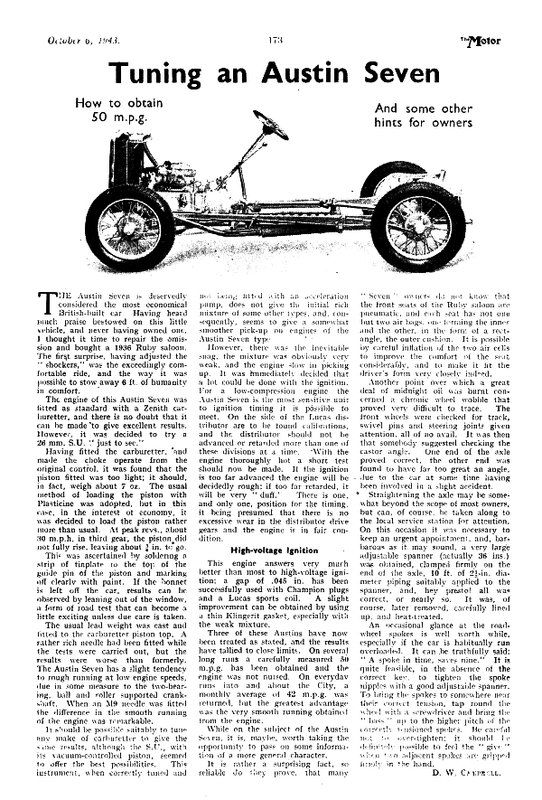 Tuning & Maintenance of the Austin Seven From The Light Car & Cyclecar, June 6 1930.